ROUNDING A CURVE at high speed - the “Flying Hamburger” on its non-stop journey between Hamburg and Berlin. THE almost frantic development of speed in all forms of transport has not left the railways untouched, as we have already seen. Britain, France, Germany and other countries have made a beginning - and France and Germany particularly have been making and still are making more than ordinary strides. To travel on the “Flying Hamburger” type of train is an experience in itself, but one that must, in time, become a part of normal transport. The “Flying Hamburger” type takes the place of the “F.D.” (long distance) trains. It carries 102 passengers and reaches a maximum speed of 100 miles per hour, with an average speed of 77·4 miles per hour from Berlin to Hamburg and 76.3 miles per hour in the reverse direction, on the run of 178·1 miles. The fare on this train costs no more than that of a second-class journey on the “F.D.” Expresses. The successful trips of this new method of transport in Germany have already impressed the world. The train has been so extensively filmed, and generally publicized that the Zeppelin airship could well be envious of the fame achieved overnight by its competitor. Anything so popular had to have a popular name, and after three had been proposed it was decided to use the description “Flying Hamburger”. 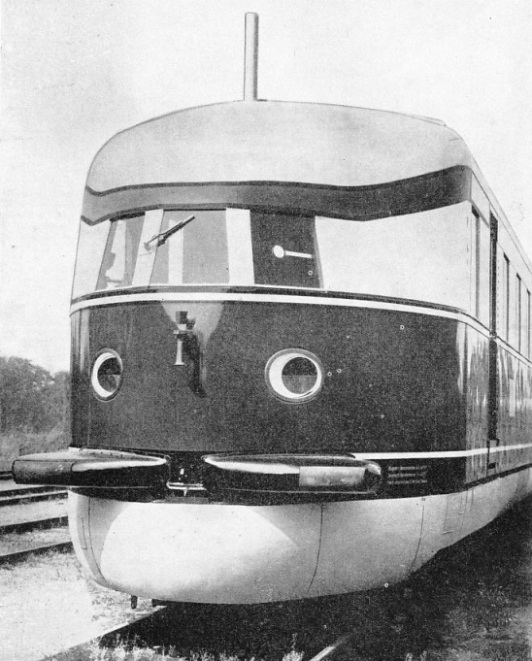 When viewed from the front the train bears a remarkable resemblance to a grotesque face, as will be seen from the illustration on the following page. It cannot be called a “Zeppelin on rails”, since it lacks the propellers of the fast train, constructed by the engineer Kruckenberg of Hanover, which reached a maximum speed of 124·26 miles per hour; but it certainly is appropriately called the “Flying Hamburger”. The secret of this flying wonder’s speed lies partly in the fact that its constructors have succeeded in reducing air resistance to a minimum. To find the most practical shape, specially constructed models were blown through the so-called “wind canal” used for testing Zeppelin models. As a result of these tests, the ends of the train were sharply rounded, the tops at either end were curved sharply downward, and the running gear was aproned with sheet iron nearly down to the rails. Thus a streamlined construction was arrived at. So far as possible, nothing was permitted to project, the only indispensable projections being a buffer below the two headlights, which look like great eyes, and the exhaust pipe at the head. In the effort to reduce the resistance of the air, the body of the train itself had to be made as light as possible. The motors, therefore, in contrast with the American constructions of electrically-driven trains, were placed in the running gear. The weight of the train was reduced to the extreme possible limit. It is really a double coach of two halves, with two axles at cither end and a common axle in the middle. Two Diesel engines, manufactured by the Maybach Motor Works, generate 410 hp each, which power is communicated electrically to the driving wheels. The technical engineering wonder is the fact that both motor and electrical generator are placed in the running gear together - an achievement which would have been regarded as impossible some years ago. STREAMLINED FOR SPEED, the “Flying Hamburger” presents a remarkable appearance at the front end. The wheels are shielded by a sheet metal apron, and above this is a pair of cushion-type buffers. The circular openings contain the powerful headlights, and between them is the warning whistle. The driver's cabin has plate-glass windows, with a wiper for use in wet weather. The pipe in the roof is the engine’s exhaust. No genius falls from heaven, according to an old proverb, and in like manner no technical wonder is born overnight. 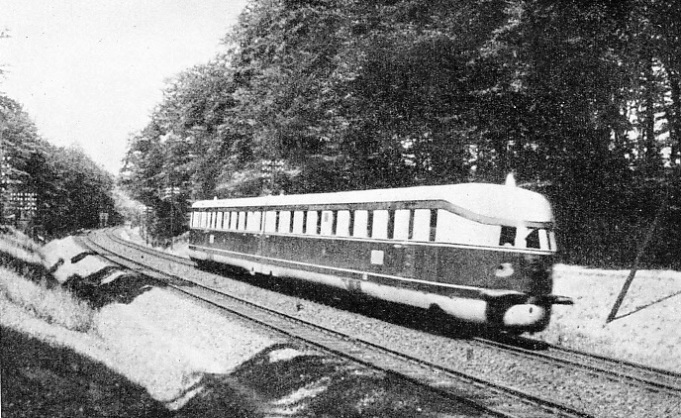 In an attempt to construct the fastest train in the world, the German Reichsbahn has been carrying on experiments with motored wagons for many years. Only the employment of 12-cylinder Diesel-Maybach motors and experi-ments with models in the wind canal of the Zeppelin Airship Works made it possible for the Görlitz car shops (the Wagen- und Maschinenbau A-G, known as the “Wumag”) to produce the flyer. There are no separate compartments in this train. Each of the coach’s halves is one large saloon, with seats for about fifty persons. On one side of the corridor are sections of two seats facing one another, each accommodating three persons, and on the other side are two corner seats for one person each. Luggage is cared for in the baggage-room in the front. As soon as the passenger is seated, a waiter of the “Mitropa” appears with a list of warm and cold drinks and cold refreshments, and small portable folding tables are placed in front of the passenger. There is a bar in the middle of the train. It is just large enough for the barkeeper. It is, like the kitchens in the “Mitropa” dining-cars, a wonder of room economy, for the attendant can conjure up all the liqueurs, mineral waters, beer, wine, the sandwiches, coffee, tea and bouillon, which are to be had here à la carte. Fifteen minutes after leaving the Berlin station, as soon as the yards and switches of the city are left behind, the speedometer reaches 130 kilometres, and then moves up surely and rapidly to 160, which is almost exactly 100 mph. The clicks at the joints of the rails follow one another ever more speedily, until they finally merge into a continuous song. The landscape flits by, and the names of the stations can hardly be read, since the “Flying Hamburger” flashes through them so swiftly. All danger of accidents has been reduced to as near the vanishing point as is humanly possible. There are as many as four different ways of applying the brakes. If the motorman or his assistant should pass an adverse signal, the train would be automatically brought to a stop by an inductive braking system worked from the signal. This automatic electric braking begins at the first warning signal, which stands three-quarters of a mile before the final stop signal, and compels the motorman to reduce his speed so that the train comes to a stop before the final signal is reached. But if he should, nevertheless, run past this signal, a second electric impulse applies an emergency brake, which acts immediately. Speeds up to 100 miles an hour for all through trains on the main lines is the goal at which the German railways are now aiming, and it is for this reason that more highly perfected safety measures are being devised. Hence, a special department has been created in the central operating division in Berlin for the development of control mechanisms. The intention is to instal generally the electro-magnetic (inductive) system of train control which is operative on the “Flying Hamburger”. Such a system comes into operation at all speeds above 100 kilometres (62·13 miles) an hour. The newly-introduced inductive system has the advantage, as against former systems, that no parts of the power plant come into physical contact with the apparatus on the lines. The power-plant is equipped with a magnet which constantly sends out electromagnetic waves of a fixed frequency throughout the trip. At all precautionary or stop signals along the line magnets tuned to the same frequency are attached, protected by cases. If the signal stands at “track clear”, the magnet of the locomotive is not influenced. If it stands at “stop”, however, different results ensue. The first experiments in this direction were made with a magnet of only one frequency in the locomotive, but the most modern apparatus permits the generating of three different frequencies. A frequency of 500 cycles per second brings a full stop at the main signal, one of 1,000 cycles per second a warning at the precautionary signal, and a frequency of 2,000 cycles per second draws the engineer's attention to the fact that he is exceeding the permissible speed. TWO ARTICULATED COACHES comprise the complete high-speed train which is electrically driven. Power is generated by two Diesel engines developing 410 hp. The train carries 102 passengers, and has a maximum speed of 99·3 miles an hour. If the engineer passes a warning signal, the train is automatically braked ten seconds later, unless he presses the so-called “attention lever”. If, having done this, he still does not slacken speed, the brakes are applied automatically after another ten or fifteen seconds. And the brakes are immediately set automatically it a stop signal should be passed. If the train is running at too high a speed, a warning bell is sounded in the locomotive cab. Of great importance is the fact that speeds, automatic braking and the use of the “attention lever” are noted on a special recording device. It is thus possible to check the engineer’s actions from the beginning to the end of his journey. About 1,600 miles of the German railway system have already been equipped with inductive signals, and the work is proceeding rapidly. The six new motorized trains, after the style of the “Flying Hamburger”, to be operated on the Berlin-Cologne, Berlin-Leipzig and Berlin-Dresden routes, are also equipped with this system. There is no doubt that Germany has made extraordinarily rapid progress in the design and operation of streamlined speed trains. The journey from Berlin to Hamburg is the fastest schedule in the world, though comparatively short in mileage, and the presence of fog does not appear to make much difference to the speed of the train, thanks to the methods of signalling described above. Even when the train is moving at nearly 100 miles an hour there is little, if any, vibration and the passenger is hardly aware of the speed at which he is travelling. To travel in the engineer’s cabin is another story. Here the impression of speed is pronounced, but the two engineers (both capable of driving the train) are not concerned by it. They are too intent on their tasks and too familiar with the experience. The popularity of the German streamlined train is already well established, for the “Flying Hamburger” is generally well-filled both on the morning and afternoon journeys. The train is yet another testimony to the good workmanship and efficiency of German engineers and designers. 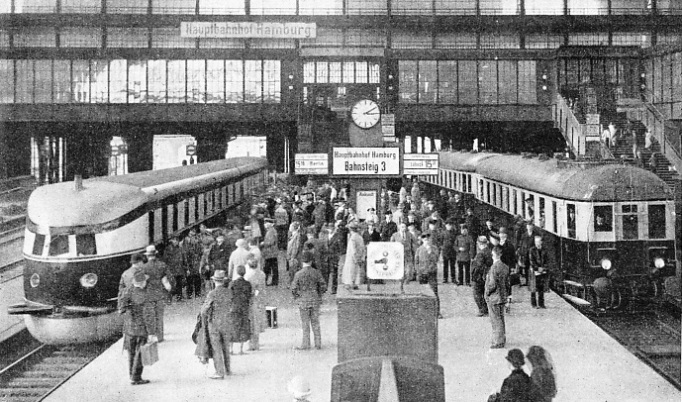 The German plan is to speed up railway development by substituting motor coaches wherever possible, running at higher speeds and shorter intervals, and paying the minutest attention - after the German fashion - to all possible engineering devices that can save a minute here and a minute there. The speed of nearly a hundred miles an hour on the “Flying Hamburger” and other German high-speed rail cars is not set as a maximum limit, for German engineers are of the opinion that when sufficient attention has been given to the improvement of technical devices far higher speeds should be an everyday possibility. The “Flying Hamburger’s” 100 miles an hour limit is considered merely as a workable speed in conditions now prevailing, for this train has reached considerably greater speeds under special tests. The general German speed-up is confined mainly to internal traffic, as on trans-continental trains there are international complications and the necessity for providing adequate feeding and sleeping accommodation; but all main line time-tables within Germany are constantly undergoing revision, to bring all the most important of outlying German cities within half a day’s run from the capital. This means a considerably higher average main line speed than has ever previously operated in Germany. It means, too, the readjustment of the curves on many miles of track, changing the distance between signals, and the solving of the problem of bringing trains to a standstill in the shortest space of time with minimum discomfort to the passengers. In this way Germany has become one of the most railway-conscious nations, as is proved by the advance in trains of the “Flying Hamburger” type. You can read more on “Germany and Holland”, “Some German Achievements” and “Speed Trains of Europe” in Railway Wonders of the World.